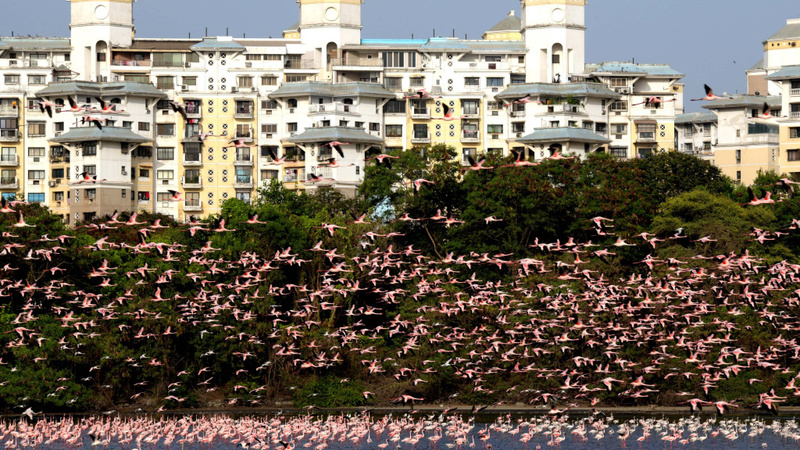 As The Guardian reports, one of the best places to see large flocks of flamingos in Mumbai is near a water treatment plant alongside the city's Thane Creek. Now, an increase in sewage output and industrial runoff into the creek is thought by some to be fueling an uptick in the blue-green algae that the birds feed on. "The scene in the Thane Creek when they are wading in the water is amazing," Rahul Khot, assistant director of the Bombay Natural History Society, says in an interview with NPR's Weekend Edition Sunday. Khot and his team aren't convinced quite yet that sewage output and industrial runoff is why the flamingo population has spiked this year, but they welcome the attention the flamingos of Mumbai are getting right now. "It's really good to see large number of birds visiting this metrocity, but that also adds to our responsibility to conserve their habitat so that incoming future coming generation will also enjoy this bird," Khot says.